Is enthusiasm for Big Data wavering? In 2015, McKinsey Global Institute claimed that the IIoT had the potential to create as much as $3.7 trillion in economic value in the global manufacturing sector by 2025. They also predicted that 80 to 100% of manufacturers will have implemented IIoT applications by then and already be reaping the benefits of data-driven insights into their operations. When Gartner surveyed manufacturers in 2016, nearly three quarters said that their organization had invested or were planning to invest in Big Data, perhaps putting the manufacturing sector a bit ahead of schedule. However, the Gartner survey also uncovered signs that Big Data investments may not yet be providing the anticipated returns. A full 85% of projects were still at the pilot stage. And, as further evidence that enthusiasm for Big Data may be wavering, only 11% of those who said they had invested claimed their Big Data investments were at least as important as other IT initiatives. From our perspective, a large part of the reason Big Data/IIoT projects fizzle out is because team leaders and company executives don’t have a clear vision of the purpose of the initiative. They gather data as though it were a valuable raw material, but then they struggle to make anything useful out of it. 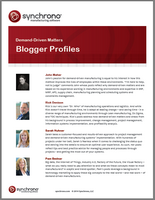 In this post, I’ll cover the three ways you can use Big Data to improve operational performance. Predictive maintenance is probably one of the best-known applications of predictive analytics and Big Data. Before the IIoT, manufacturers had to guess how long a piece of equip ment would last and when it would need maintenance. Unplanned downtime was common and costly. Intelligent machines (even if that intelligence is retro-fitted) provide alerts on when the equipment is performing outside of normal parameters, e.g., running at a higher temperature indicating excess friction. And when connected to smart manufacturing tools like SyncOperations™, automated workflows and alerts to maintenance address the issue before it becomes a problem. 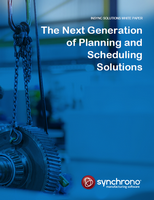 From a demand-driven manufacturing perspective, this turns unplanned downtime into planned downtime and gives the planner/scheduler time to adjust and optimize flow. 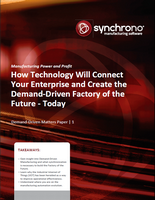 Related resource: How Technology Will Connect Your Enterprise and Create the Demand-Driven Factory of the Future – Today. #2 Continuous improvement – Continuous improvement is the cornerstone of any Lean initiative and has become a best-practice throughout the industry, even in those organizations that don’t consider themselves Lean. Big Data gives you the data you need to measure what matters and the ability to work with real data as opposed to someone’s best guess about what’s happening on the factory floor. Of course, it goes without saying that a BigData initiative is only as good as the data the manufacturer has to work with – and if the right data can be accessed by the right people at the right time. In a typical manufacturing operation, data may be stored in dozens of places. Managing issues impacting production is easier with software like SyncManufacturing™ that can leverage its own data in addition to that stored in an ERP or other external system – and use it to make real-time adjustments to ensure production is flowing and resources are synchroni zed throughout the factory and extended supply chain. #3 Real-time responsiveness – Finally, most manufacturing operations can be considered something like “controlled chaos.” Rush orders come in. People get sick. Raw materials shipments are delayed. Scheduling to known constraints is a piece of cake compared to optimizing flow when the unexpected happens. 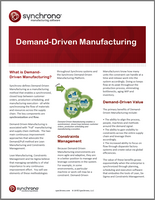 Demand-driven manufacturing can take signals from the shop floor to automatically synchronize production based on what is actually happening in your operations. 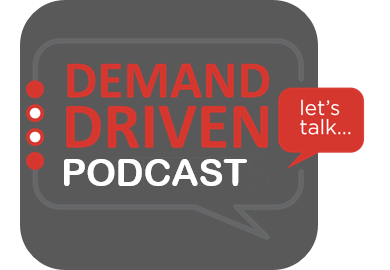 Just as you wouldn’t buy a piece of equipment without knowing what it’s for, you shouldn’t launch a Big Data initiative without knowing what you want to accomplish. Beginning with a clear idea of what you want to accomplish can help keep enthusiasm high and ensure you see a return on your investment and efforts. 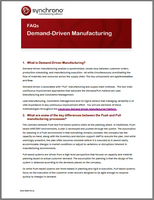 See why Gartner has designated us as a supply chain planning system of record (SOR). Privacy Statement | © 2019 Synchrono, Inc. All Rights Reserved. Please complete and submit the following information to download the white paper. Thank you for your interest in Synchrono!